Celebrities are fun, and everyone knows many of them out there. With this in mind, creating your own exciting bingo card for any event where you’d like to play games is a good idea. If you’re wondering how you can go about this in the easiest way possible, please refer to our instructions below. Not only will you have an awesome bingo card made up, but you’re able to play the game with so many people and have a great time doing so! Get a square bingo card template to start with. You will want to blow up the boxes in them to ensure that you can fit the celebrities faces within them fairly well. Obtain pictures through a search engine of the celebrities that you want to add to the spaces. You can choose any celebrities that you’d like. Save them to a separate folder on your desktop so you know where to find them later on. Open the pictures in a paint program on your computer. As you open them, place them in the provided squares. You want to make sure that they fit nicely and that they are not too pixlated that you cannot tell what their faces look like. You’re able to add smaller text boxes within the boxes of the faces to put their names, but this is optional. If you think that some of those playing the game might not know what the faces of those you’re naming look like, you’re going to want the names. Make sure to leave the bonus box open in the middle! 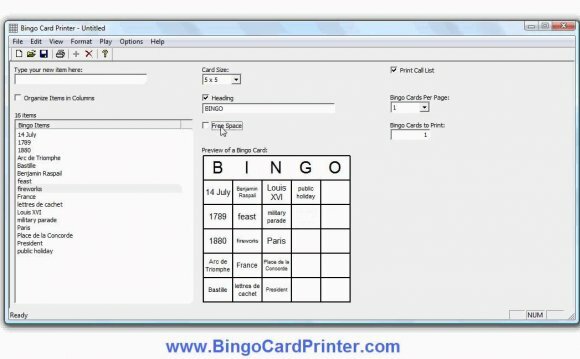 Print out the cards that you have just made and make sure they print well. You want to make sure the quality is high enough to make out the faces! Go back to the paint program and the card that you’ve just made and switch the faces around to the different boxes. This is going to create a different card, so that everyone does not get bingo all at once. Print this version out next. Do this again three more times so you have enough variations of the game for everyone to use. Depending on the amount of people that are coming, you can print a new one out for everyone or pass out a jumble of a bunch of different ones. The markers in the tools list are used to mark off the spots that people have gotten so that they are able to keep track of the ones that have been called out. You have to make sure that you keep the pictures on a separate sheet of paper. They do not have to be in the bingo format, but their names would be ideal so that when calling them out, you know what you have and have not called for those that are participating.